As I was coloring my drawing, I couldn't help but think of how tropical it looked. The dragonflies remind me of Macaws that fly through the rain forest. A beautiful fairy looks out a window that is surrounded by a stain glass feel. 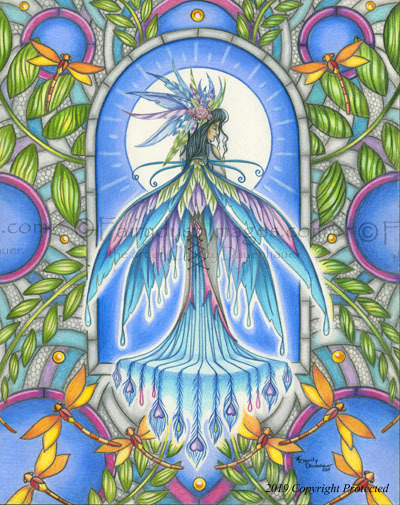 This enchanting fine art print is a reproduction from my original colored pencil drawing. This print measures 11"x 14" and has been printed on heavy matte photo paper with Epson archival pigment based inks. The colors are very vibrant with detail that can not be surpassed. There is a small white edge that boarders this print to help in the ease of matting and framing it. This item will ship flat on backing board inside a clear plastic sleeve.